Enjoy reading and share 32 famous quotes about Sorry With Love with everyone. “I have never felt so lost as I have these past two weeks. I can't believe I never even recognized the depth of feeling I had for you ... until I lost it. I'm so sorry I did that to you, Emily. I promise I will hold your heart with the greatest of care if you'll trust it to me. “You look the most lovely I have ever seen you, my Mary, and I have studied you and dreamed of you for long years now." He brushed her lips with his and straightened. "I never despaired that this day would not come, but to tell you true, now that it has, I can hardly believe it." She had known for a long time that putting her needs above those of Adam's wife and children was indeed selfish. She had no real answer to the accusation thrown at her. "I'm sorry" she said, with her head in her hands. "you're sorry?" came her adversary's disbelieving reply. "I am. I'm sorry he married you when he was in love with me. I'm sorry I couldn't have loved someone else. I'm sorry your marriage is a joke and I'm sorry that I'm alone. I'm sorry for a lot of things - for you, for your kids, for me and for him. I spend most of my time being sorry." For a moment there was silence at the end of the line. "all you had to do was stay away"
"if only I could have." tears escaped and raced down her cheeks. “My mouth hung slightly open, i was getting ready to sat something important. what i wanted to say was: I's so, so sorry. but instead I said, "i love you." Only then, when i said it out loud, did i know that it was true. “I'm sorry for calling you so early, but this couldn't wait. I can't go to dinner with you on Wednesday." "I can't see you at all actually." “I've never been more sorry in my life about anything. “I'm so sorry, sweetheart. I'll let you go, but don't expect me to forget you. We're bonded. I'll be on your trail, doing everything in my power to win and romance you. So prepare to see a lot of me. I love you too much to let you go." "You should know that I'm not sorry either. I'm not sorry that I want to do these things with you. I'm not sorry that I want you so much I can't think of anything but you. But most of all, I'm not sorry that I love you. I love you. I love you." I pause and listen to the low scratch of a pencil on paper as it carries all of my feelings to him, my one. Before I finish, to the heavenly sound of him sighing with pleasure. “I'm sorry. I love you, but it's an enormous conflict of interest." Her head snaps up, "You love me?" "What?" MY face is suddenly on fire. "I never said that." "You did. I heard it." "I said I'd love to." "No," Sage says, a grin splitting her face. "You didn't." “When he pulled back, Blay frowned. "You're shaking." Was it possible he wasn't imagining this? "Am I?" the rest of it's in the past." "I just ... God, I really am shaking, aren't I? As would let him in-and take him in with tears!" I said. “Montana," he said, dragging her against him. “I'm so sorry I have this. I can't stand the thought of how much worse this is going to get. I can't stand the thought of looking at you someday, and this face I love, and not knowing who you are." She traced the outline of his jaw and chin and the creases of his sorely out of practice laugh lines with her hands. She wiped the sweat from his forehead and the tears from his eyes. "I can barely breathe when I think about it. But we have to think about it. I don't know how much longer I have to know you. We need to talk about what's going to happen." He tipped his glass back, swallowed until there was nothing left, and then sucked a little more from the ice. Then he looked at her with a scared and profound sorrow in his eyes that she'd never seen there before. 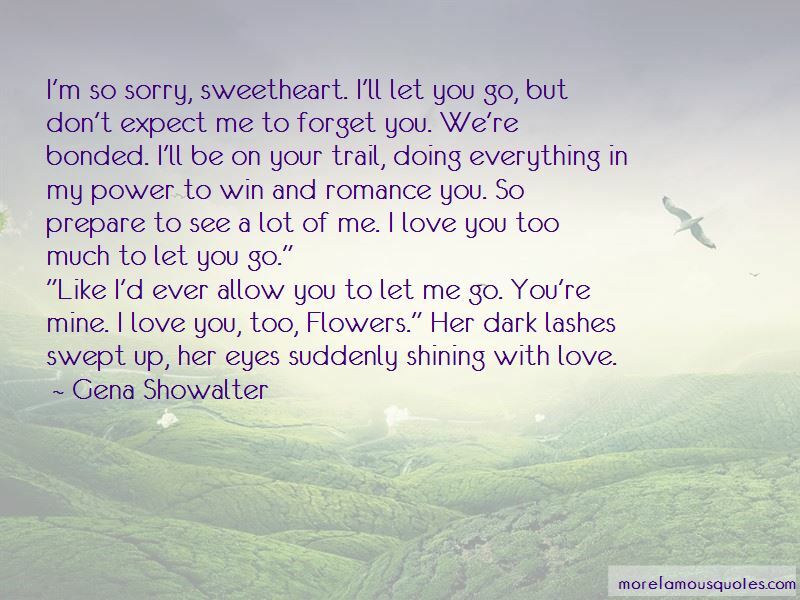 Want to see more pictures of Sorry With Love quotes? 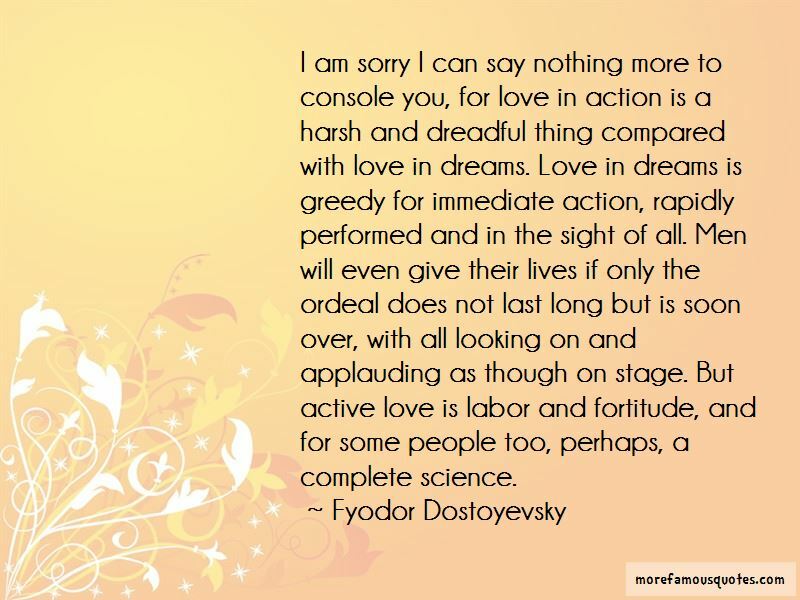 Click on image of Sorry With Love quotes to view full size.